Office places are like a second home; you spend more time there than you do anywhere else. And for this reason, safeguarding the place from evil people become paramount. However, businesses neglect its safety and end up putting office and employees at risk. Nevertheless, it only takes a few things to ensure the safety, and one such thing is installing panic/push bars. 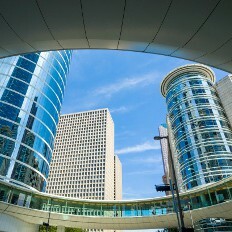 Install panic/push bars in San Antonio Texas to safeguard your commercioal property. Have you ever seen buildings with the push bar doors that read ‘don’t push the bar, the alarm will sound’, these doors are panic doors and the bar installed on them is called panic or push bar. Further, panic bars are the locking devices that features a spring-loaded horizontal metal bar set in the handle of the door. These doors come handy during the emergency or panic situations of the commercial organization. To open the door, you just have to press the lever and push the bar; the door will automatically get unlocked making it easy for you to escape. Rim Style Bars: This type of crash bars are mounted on the inner part of the door. Mortise Style Bars: This type of bars features its own locking mechanism mortised into the cavity in the door. These bars are rigid and offer complete security. They are less vulnerable to tempering and make an ideal option for the businesses that need complete security for every door in their organization. These bars are constructed with vertical rods offering complete protection through the top and bottom of the door. These bars make a perfect choice for the businesses that not only give importance to the outer security but also believe in making the individual room safe. 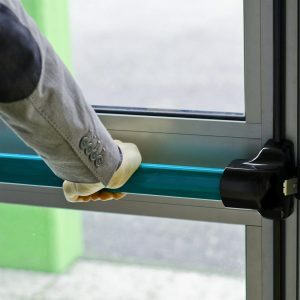 We Install panic/push bars in San Antonio Texas and understand that installing a push bar is a must for your business. The reason we strive to offer the best panic/push bars installation and repair services to our clients. We are 100% reliable, certified, insured and bonded. Our experts are dexterous in proving a commercial security system. With over 5 + years of experiences in installing panic/ push bars in San Antonio Tx, our technicians are catering to the need of every business. We believe that push bars have to be completely functional and operational, the reason we install a quality product that goes in the longer run. We also have advanced security tools and supplies that can withstand the everyday wear. When you have called a professional, trust his work and let them handle your commercial problems with expertise. All our technicians are highly skilled and possess good experience in this industry. With a good knowledge of installing high-quality push bars, we have become the most popular name among businesses. We are accessible 24 hours a day and seven days of the week. Whether it’s the dead of the night or a holiday, our emergency services providers will reach out to help you in no time. No matter what you need, be it a new installation of panic/push bar or the repair of the old one, simply drop us a call, and we’ll reach out to you. Car Key Replacement: If your car has been driven by multiple drivers and you only have one key, call us and let us make keys for you. We are skilled in making keys for all models of cars, be it domestic vehicles or foreign cars. Car Lockouts: if you have trouble inserting or removing car keys, we at Car Key Pros, at San Antonio are there to help you. Call us, and we will reach out there in no time. Car Key Programming: We have programmers who are skilled in programming all car keys. No matter what model of the car you own, drop us a call and let us help you. Safeguard Your Office By Installing Panic/Push Bar From Car Key Pros In San Antonio TX https://carkeyssanantoniotx.com/commercial-locksmith/panic-push-bars/ 3.7/5 based upon 6 reviews.